Judy from Arizona has been quilting tops for Covered in Love for a couple years now. She's the kind of quilt who enjoys the actual quilting more than the piecing (I'm the opposite) so this has been a match made in heaven. 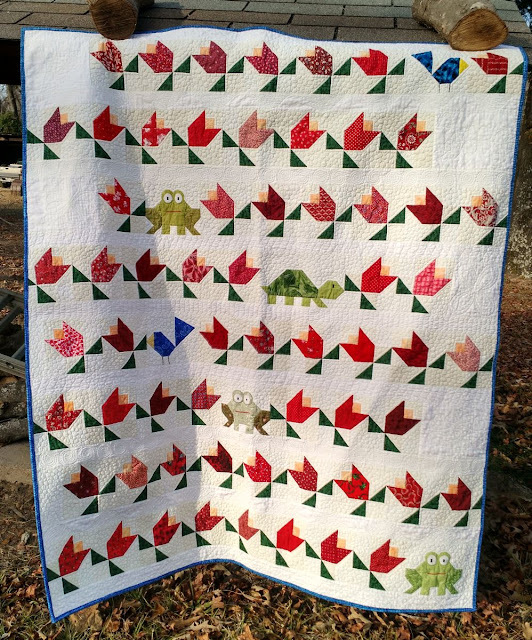 Judy takes her time and puts her heart into every top she quilts and boy, does she knock it out of the park! 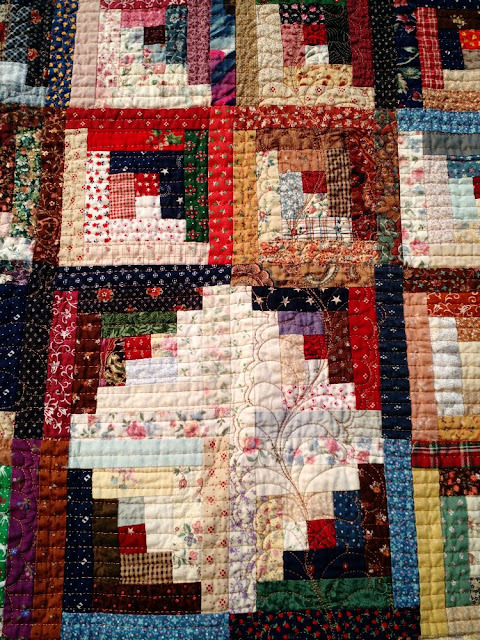 Every one of her quilts is a showpiece. This mini, scrappy log cabin was sent in by Priscilla. Each cabin is just under 5", the logs are 0.75" wide. I was so impressed by the time and effort it that went into making all those tiny cabins, I decided to send it out to Arizona. Judy went to town on this top with columns of feathers and narrow, straight line quilting. To top it off, I had a beautiful backing to match courtesy of Sandra. 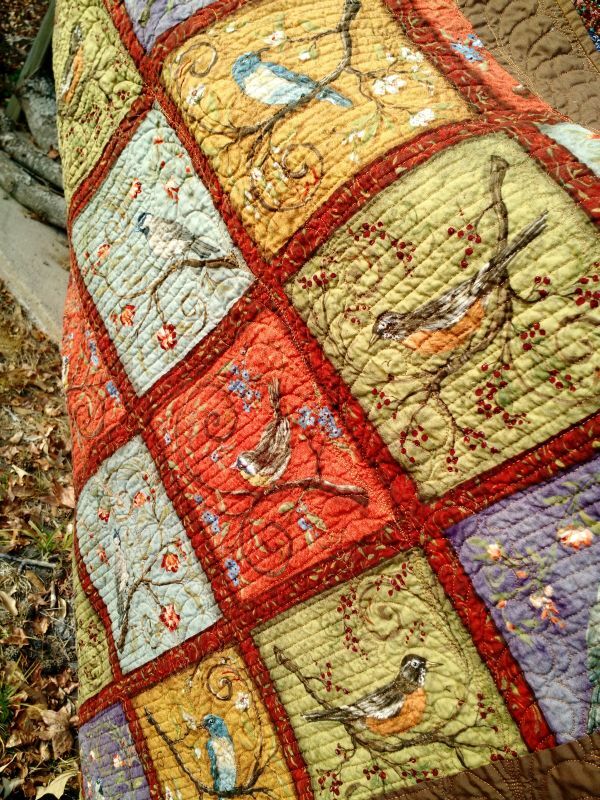 The second quilt that came back from Judy was one I pieced from a WIP given to me a long time ago by DeeDee. The project had the makings of lots of little red flowers. I must have thought at first they were poinsettias, seeing that red and green, because I had it labeled for a long time as "Christmas WIP." "Tip Toe Through the Tulips..." and past the frogs and birds and turtles. The animals were pieced based on tutorials from the Elephant Parade QAL. This one had a great backing too, more birds! 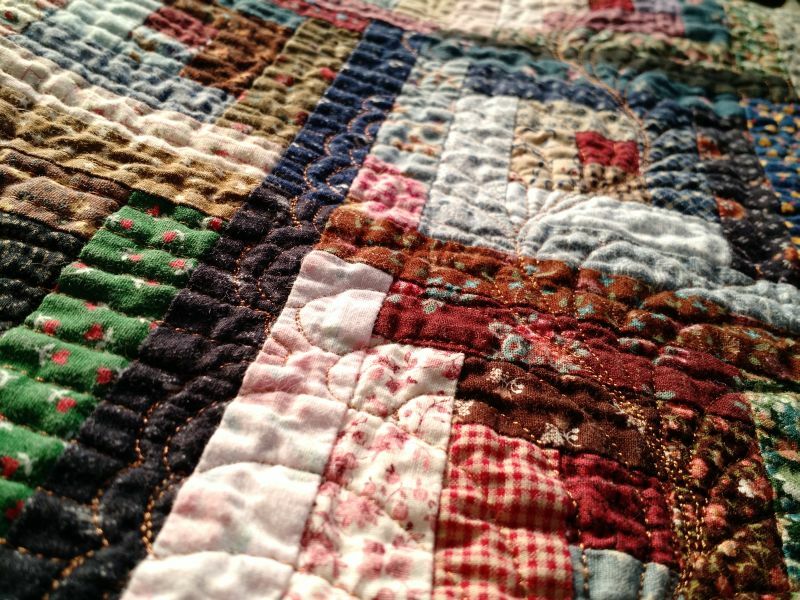 Every Covered in Love quilt is gifted to a family mourning the loss of a loved one. I'm so glad that so many quilters put their heart and soul into our quilts! Stay warm and Happy New Year! Beautiful quilts, and beautiful quilting, from beautiful hearts! Those really are beautiful, Kat! 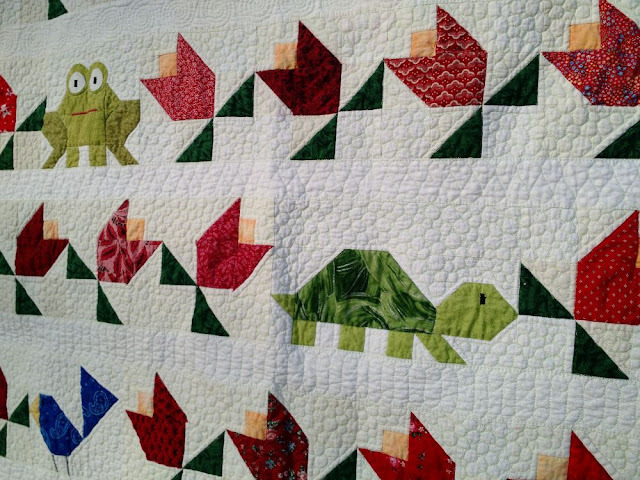 I like the piecing part, too, and the quilting much less. 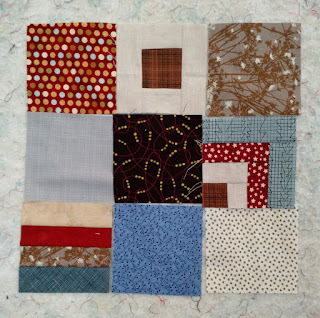 If I sent you a quilt top for CiL, what size is the best? Wow, Judy truly is a treasure! I'm with you, I'd rather piece than quilt. 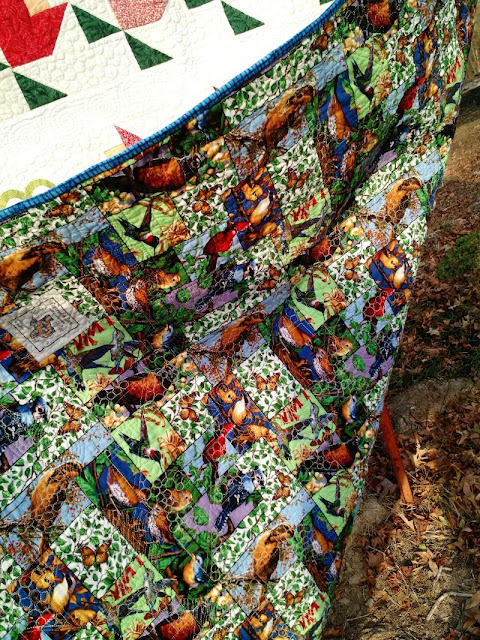 These two quilts are fabulous. I especially like the way the log cabins were set. 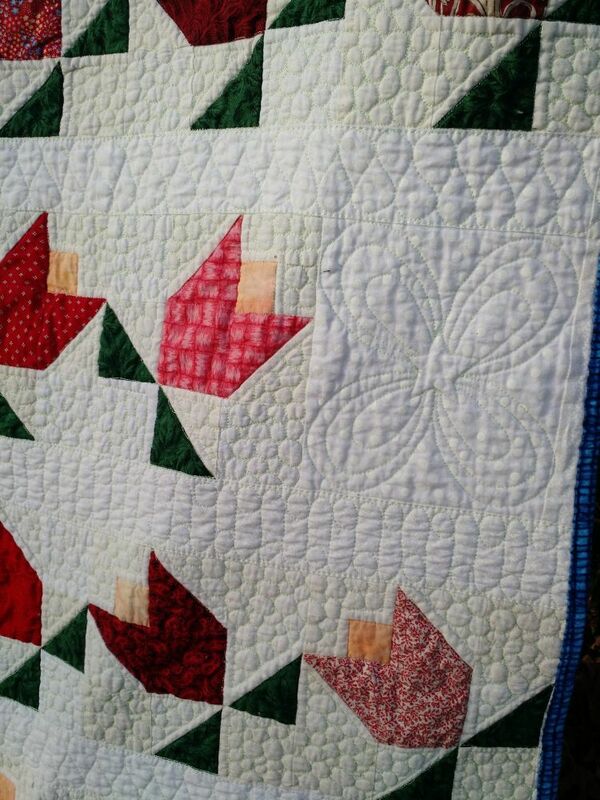 Here's to a happy new year with lots of piecing AND quilting! Wonderful collaborative quilts for the cause!! 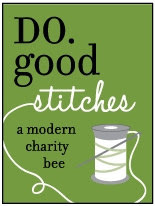 Grieving families at your hospital are SEW lucky to have you and the Covered in Love program. Kudos to Judy for doing a fantastic job with the quilting. I love what you did with the tulips and adding the animals in-between them. 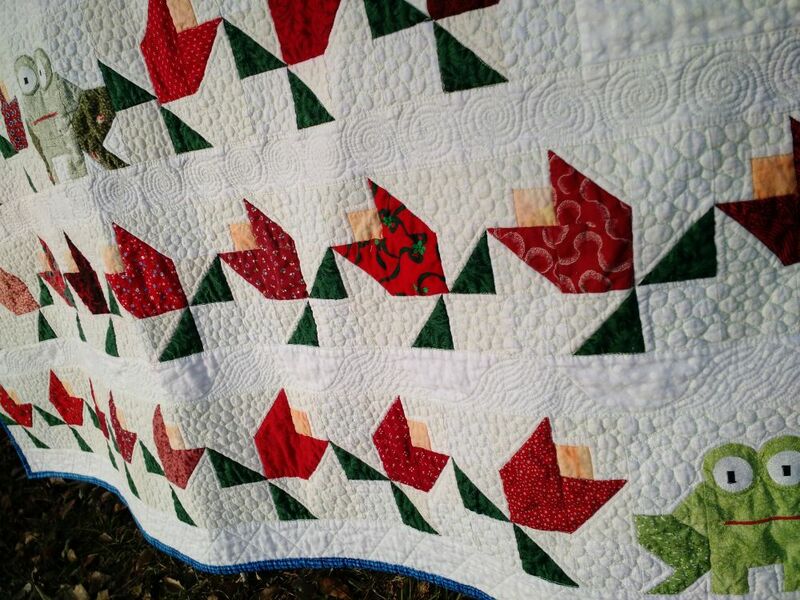 These are so fabulous, from the piecing particulars to the backings and quilting. I'm sure they will provide tremendous comfort. OMG!!! 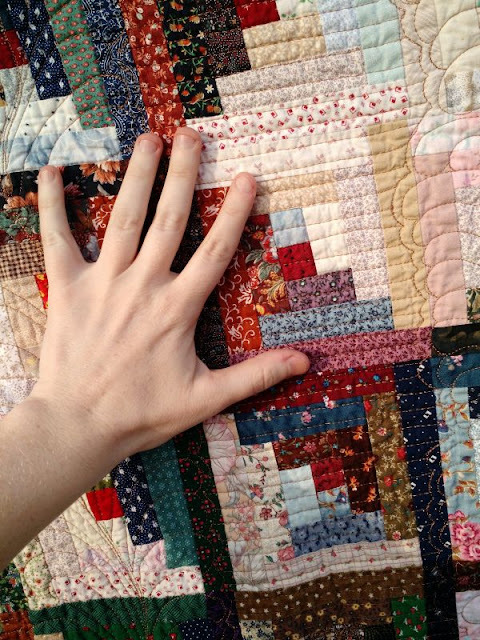 I'm in LOVE with that Tip Toe Through The Tulips quilt! The frogs and turtles are the perfect addition! 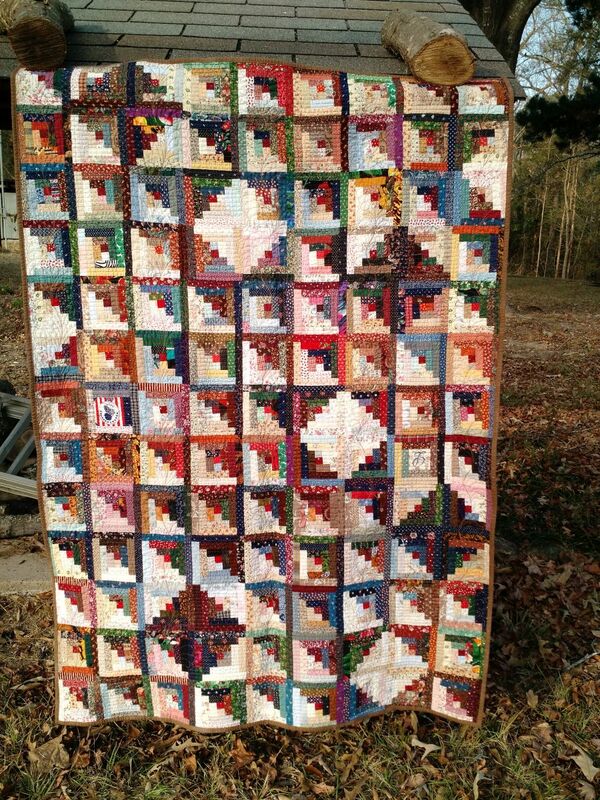 :-) The log cabin quilt is a beauty too! Admiring all those pretty scraps!